I never used to use an eye cream. I just thought I’d throw that out there, because it is only in the last year I have discovered how much I need one and how beneficial they are. Last winter I suffered really badly from dry skin around my eyes, to the point I didn’t even want to put make-up on as they were so sore or swollen. This is when I turned to eye cream and desperately searched for something to help me. From then on I have been using one every day and it makes a massive difference not only to my dry skin but any under eye darkness and also makes my make-up go on much nicer. If you don’t use an eye cream then definitely invest, yes they can be expensive but they are so worth it. I’ve been testing out a few recently, here are my thoughts. I have been using Kose eye cream since last year and I love it. It has a gorgeous texture, that isn’t too heavy especially for the eye area, but feels instantly moisturising. It’s said to revive and revitalize eyes, in which for me it has, as it combats my dry skin on a regular basis. Ingredients include rice power extract, as well as green tea and soybean which promote collagen production, moisture retention and hydration, which in turn can prevent wrinkles. I really love using this eye cream. It’s £42 for 15ml, so a little pricey but totally worth it. My pot has lasted me a long time. Bee Good’s eye cream is part of their new Youth Enhancing range which is aimed at minimising lines and wrinkles. Combining Bee Good’s staple ingredients honey, beeswax and propolis. The eye cream has a slight fragrance but is more that of the natural ingredients. It’s lightweight and after using this for a week, I found my eye area looked nice and bright and it didn’t affect my sensitive eye area at all which is always a worry for me with eye products. I enjoyed using this one and is priced at £19.75 for 15ml so a great option for those who don’t want to spend too much and want a more natural product free of parabens. I am yet to find a Murad product that doesn’t perform. This eye cream is part of the Essential-C range and hydrates and protects the eye area. It has SPF 15, which is really fantastic, I have never actually had an eye cream that has SPF in it. This is great even in winter as the sun’s glare can be really bright. I like to use this one more during the day and it’s a little thicker than the others, so it does feel very hydrating and a little goes a long way. Ingredients include shea butter, caffeine and retinol. 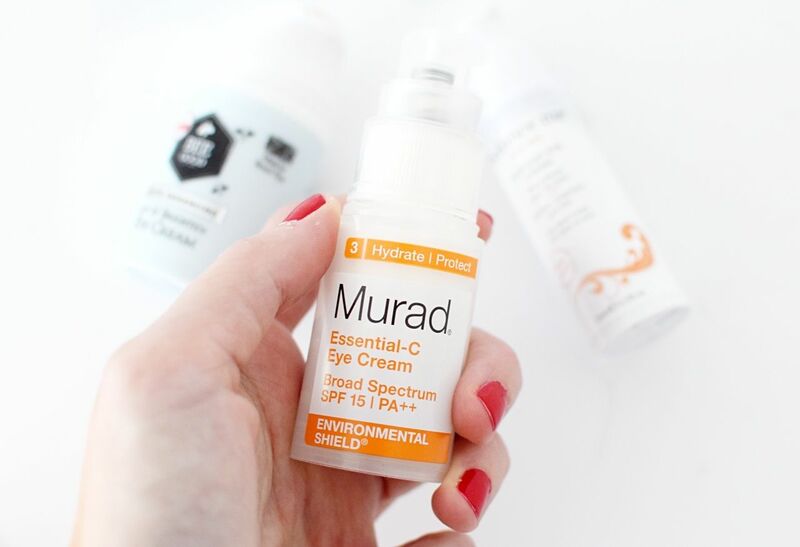 I found this really got rid of darkness under my eyes after just a few uses and so even though the Murad Essential-C Eye Cream is £59.50 for 15ml I definitely think it’s worth it. Balance me’s eye cream is 99% natural and aims to soothe, brighten and lift the eye area. This one has been designed to focus on the fine lines and dark circles. I never saw any immediate results, but I did like the texture of the cream, again nice and light. Dap it around the eye area and it helps to brighten up a weary eye area. 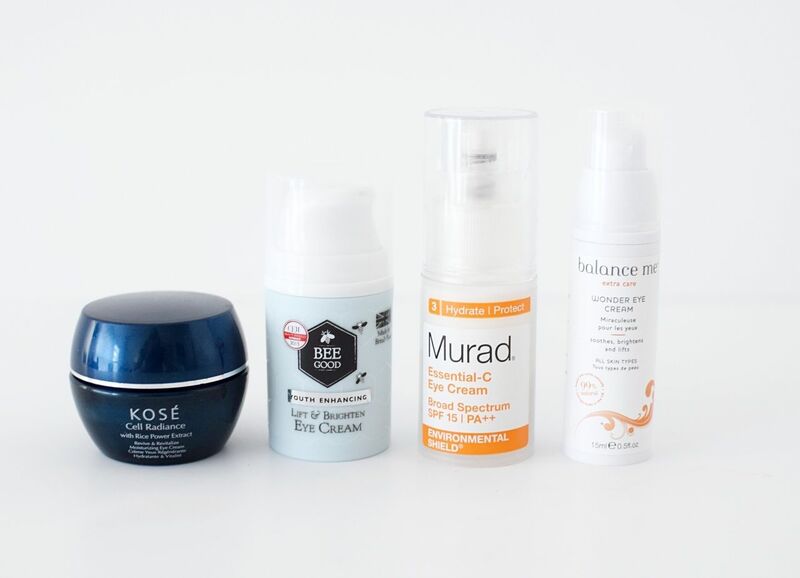 I didn’t find it all that moisturising compared to the Kose, but I guess it depends on what you need the eye cream for. If it’s fine lines and brightening this could be for you, but it wasn’t my favourite. £20 for 15ml at lookfantastic. These sound great! I’m a huge fan of eye creams as my eyes always feel so much better when I do! At the moment I’m loving the Kiehls avocado based cream – it’s wonderful!